I'm a Health teacher. Sit a girl down in my classroom and I will have that conversation. I just don't feel comfortable discussing it in the context of scouting. It's not a topic for a troop meeting, but us male Scouters probably ought to get used to hearing about it. It's just a normal part of life. I do imagine the girls would be more comfortable talking with a female, but we should be careful to not make them feel awkward about it. Interesting take on the skorts though - never thought about that. I'm 100% behind uniform updates that are thought out and practical. With that in mind skorts with pockets now make sense to me. I'm curious to see what the 11-18 year old uniform updates will bring. From experience girls typically look after themselves when it comes to periods. Scout - "I need a sanitary towel Skip, where are they?" Me - "Store room, middle shelf, next to the spare toilet role." Yes be ready to deal with it but don't worry about it. Odds are you'll never actually have to have much of a conversation about it. I do think it will be a topic to cover in bear country. I remember we talked about using non scented soap, etc. to prevent bears from being attracted to your tent. I think leaders (male and female) will be comfortable enough to talk to girls who may be having their period in the back country, especially with bears. A bear's sense of smell is so powerful, they know where the humans are without any soap or other smells. When camping in an established campsite, especially at a park the bears already know the site. They will visit if it is on their route, soap and other smells wont make increase it. It isn’t about bears going to the camp, it is about not enticing them to enter tents. Anything that had a “smell” would go in our food pack and be suspended appropriately on a tree limb. I would guess that used tampons would have to be included in a sealed bag. I don’t think those would belong in a back pack in a tent. Adult leaders who understand this type of camping would consistently remind our SPL to ensure policy was being followed. Not a major deal, but male leaders may have to feel comfortable talking with female SPLs or scouts about handling tampons in the back country areas. I know some Venturing groups already deal with this. Separate point, on one trip deep in the BWCA we had a camp location on an island with no trees. We were told that if we ever encountered that situation to lash our food Pack under a canoe and then put paddles, pots and pans on top of the canoe to scare away the Bear. Needless to say, at ~2am we found that bears do not scare that easily. New Cub Scout books will be available in June. 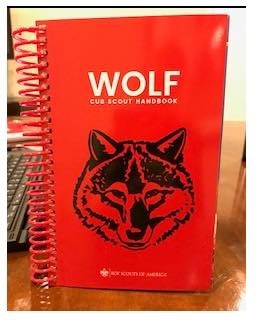 They are integrating the new requirements (that were previously in an addendum), rewording for gender and using the new Cub Scout color scheme. Old books still work if you have the addendum. See pic of the Wolf book attached. Or “scout” “youth”... Pictures are still used but there will be both girl and boy Cub Scouts integrated. It depends on the bear, the common black bear as a rule will not attack humans, all the many ones that I have seen have run away as soon as they saw me. I have little fear of little black bears. A grizzly bear will attack humans, they are well know for that. Menstrual blood is not a factor. So... if the CO wants to permit girls to join a scout unit associated with their CO, they need to charter a new unit. What's the fee for that again? Suddenly the push to create paper units with paper leaders when everyone is meeting together at the same time and place makes more sense. If I may ask, where did you get this photo and information? Mind you, it's not entirely surprising, but what is the source of this picture? I confess the cover is ... well, boring to say the least. I hope they don't go with this monochromatic style in the end, but curious to know more. At least they are incorporating the addendums into it, but as the leader of an all-boy unit, I hope they don't go overboard with the gender-integration images inside. And what about our old friend Ethan? Will his twin sister Edna be joining us now? sigh ........ I know it's been said a million times over, but this whole inclusion thing is really ruffling my feathers again, lol.